Please Click & Print Them If You Wish To Use Them. All you do is drop off your clothes with us and we will do them for you. Your clothes will be handled with the up most delicacy and professionally folded by our fully trained staff. 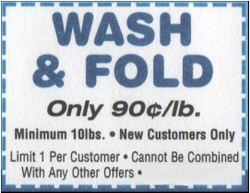 All you have to do is present the coupon to the right when you drop off your clothes.